If you've ever craved a brownie-type treat and cotton candy simultaneously, these are your bars. Sinfully sweet and fun to eat, you'll love them!! Preheat oven to 350 degrees F. Lightly grease a 13×9 inch baking pan with cooking spray. Set aside. In a large bowl, mix together the cake mix, eggs, oil and ONE packet of the cotton candy mix with a rubber spatula until blended and combined. Stir in the chocolate chips. Stir the remaining flavor packet into the can of icing (or prepare your own vanilla buttercream, if you wish). Spread the icing evenly onto the cooled bars and top liberally with sprinkles. Pop in the fridge to set the icing for about an hour before cutting into squares. Store airtight for approx. 3 days. 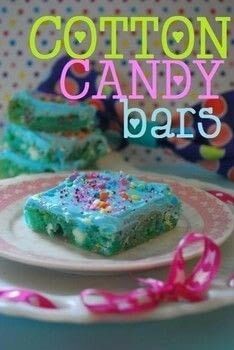 I am dying to make these!!! Are they as sweet as they look oe should I for a lighter frosting?